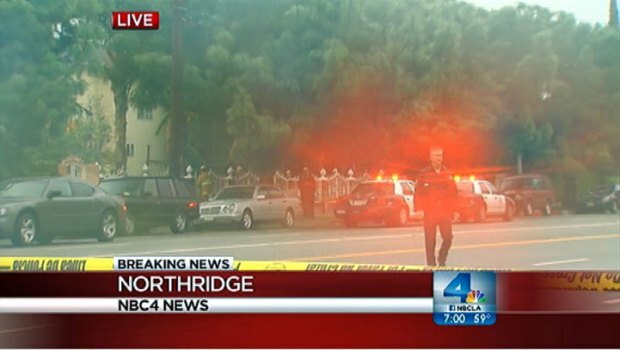 Four suspects have been arrested in connection with a quadruple homicide at an unlicensed boarding house over the weekend in Northridge, the Los Angeles Police Department announced Tuesday. Police tracked the suspects' vehicle -- a black Audi without license plates -- to the Silverton Hotel in Las Vegas on Sunday night, according to the Las Vegas Metropolitan Police Department. The suspects were arrested without incident. LAPD Chief Charlie Beck on Tuesday identified them as 31-year-old Ka Pasasouk of Los Angeles, 30-year-old Howard Alcantara of Glendale; 30-year-old Donna Rabulan of LA; and 31-year-old Christina Neal of LA. Charges have not yet been presented to the District Attorney's office, and the suspects are still awaiting extradition to LA, Beck said. Police are seeking murder charges against Pasasouk, accessory after the fact charges against the others, and an additional charge of robbery against Alcantara, Beck said. Beck wouldn't go into specifics about the investigation, but he did attribute the arrests to "some brilliant detective work." LAPD Chief Charlie Beck announced four people have been arrested in Las Vegas in connection with the shooting deaths of two men and two women outside a home in Northridge over the weekend. 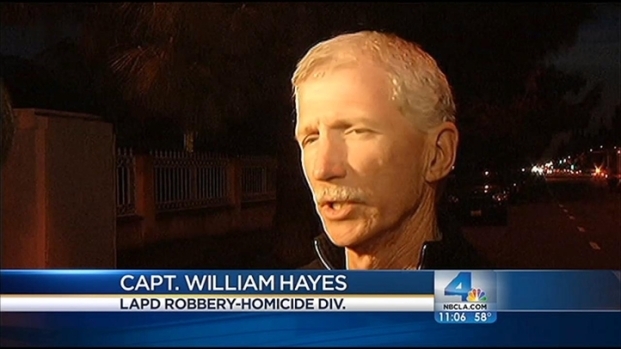 John Cádiz Klemack reports from police headquarters in Downtown LA for the NBC4 News at 5 p.m. on Dec. 4, 2012. "It's a huge tragedy in any community, especially one that is relatively violent-crime free. Obviously this has a tremendous impact not only on the community, but on the public safety employees that respond," Beck said. "Believe me, every one of these detectives that work this case, they own those victims. This is not a job to them. This is what they do for a living. This is their passion. They believe in these victims; they want to find justice for these victims," he said. The shootings were first reported around 4:30 a.m. Sunday. The victims -- two women in their 20s, a man in his 30s and another man in his late 40s -- were found fatally shot outside a home in the 17400 block of Devonshire Street in Northridge. LAPD detectives are trying to piece together just what happened at a house in Northridge. Four people were found shot to death there. Jane Yamamoto reports for the NBC4 News at 11 p.m. on Sunday, Dec. 2, 2012. "This is the one of the worst and heinous crimes we've seen in our community and, as the councilmember representing the area of Northridge, I will tell you I was shocked when I got the phone call, when I showed up at the scene and so was the community," Councilman Mitch Englander said at Tuesday's news conference. Much is still unknown about the residence where the four bodies were discovered. It has been described as a boarding home and had as many as 17 residents. The victims' names are under a security hold, but family members identified one of the victims as Robert Calabia, 34, a home healthcare worker (pictured at right). A memorial outside the home identified another one of the victims as Amanda Ghossein, who would have turned 25 on Tuesday.